Home > Product Catalog > Aquaponics/Hydroponics > Nutritional Additives > Vegetable & Fruit Yield Enhancer - 32 oz. 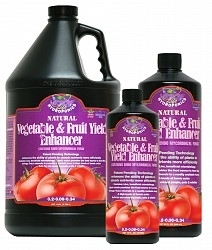 click image to view larger Vegetable & Fruit Yield Enhancer - 32 oz. Get greater results with less fertilizer with Microbe Life/Vegetable & Fruit Enhancer - a unique soil conditioner that is unparalleled and superior to any other! Derived from an extremely rare and highly decomposed organic humus deposit, it provides a much healthier soil structure and an enhancement to the ability for plants to absorb nutrients. Note: This product cannot be shipped to the following locations: California, Illinois, Louisiana, Mississippi, Oklahoma, Oregon, South Dakota, and Wisconsin.